The “talkers” and “discussers” now become the “trippers” and “askers,” those well-meaning people who occupy our days with talk of all the things that we often trick ourselves into believing actually form us—our childhood, our local environs, our dress, the latest news of wars, sickness, the stock market. These things do in some ways make up what we are, but there is something about each of us that goes far deeper. We are always surrounded by those who want to “pull and haul” us toward their own beliefs and concerns. The poet here tells us that he, too, wasted years trying to penetrate the “fog” of all the arguments of the “linguists and contenders”—those who use language to complicate life and divert our attention by getting us involved in the petty squabbles that occupy most people’s lives. Now, though, we are invited by the poet to contact the deeper area of ourselves that stands “apart” from these forces that are always trying to divert us from the self that matters. 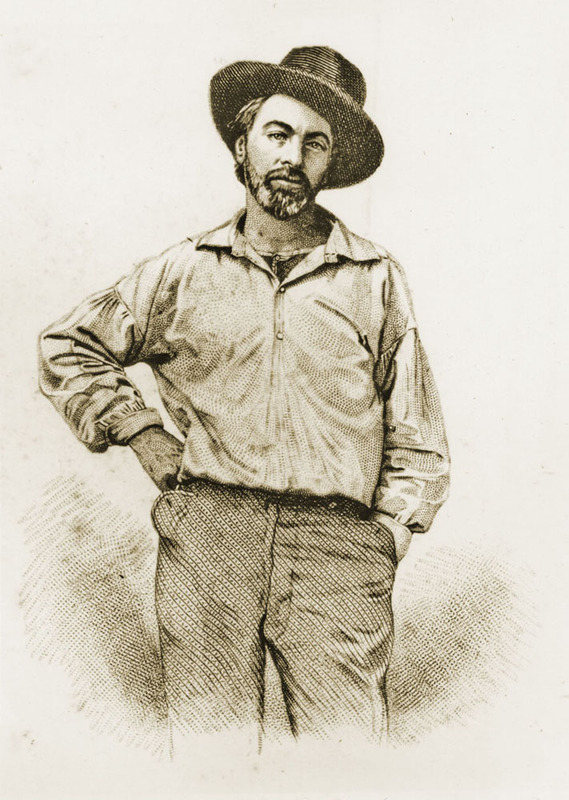 Whitman here offers in words an image to match the engraving of the poet on the frontispiece of his first edition of Leaves of Grass, the poet in working-class garb, hat on, arm akimbo, fixing the reader with his penetrating gaze—a man who “Stands amused, complacent, compassionating, idle, unitary,” one who “Looks down, is erect, or bends an arm . . . Looking with side-curved head curious what will come next.” The trick, Whitman says, is to figure out how to be “Both in and out of the game and watching and wondering at it.” Unlike Thoreau, who sought his deeper self by removing himself from other humans, retreating to the wilderness, Whitman seeks the deeper self by carefully observing his urban surroundings, learning how to absorb it all while also standing apart from it, learning to “witness and wait,” to give himself time to see what is worth seeing. He will seek his “Me myself” not only in nature but in the multitudes of people he encounters daily, people who will challenge him to widen his sense of who he is. The poet C. K. Williams begins his book-length meditation on Whitman wondering “where his music came from”—a question that has haunted generations of readers and writers. How did an ordinary newspaperman and sometime carpenter become the poet central to American identity? Williams believes that “we’ll never know when he first intuited, and heard, and knew, that surge of language sound, verse sound, that pulse, that swell, that sweep, which was to become his medium, his chariot—just to try to imagine him consciously devising it is almost as astounding as it must have been for him to discover it.” But discover it he did. And the fourth section of the poem reveals that in his literary apprenticeship Whitman “sweated through fog with linguists and contenders,” desperate as any young poet to find his voice. What he learned was how to “witness and wait,” keeping part of his imagination free from “the fever of doubtful news,” observing his surroundings with a keen eye, listening hard to the inflections of men and women from all walks of life so as to render them in his verses with the respect that they deserve.